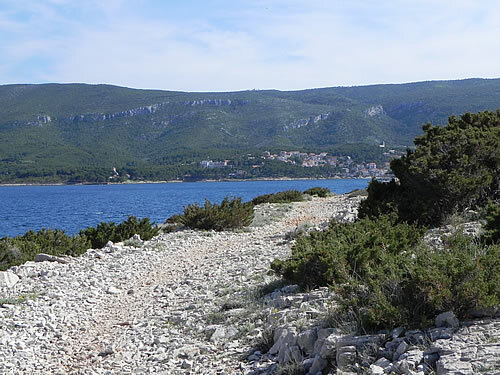 In the heat of summer the Glavica headland near Vrboska is popular for its beaches, and I see that there are plans afoot to improve the car parking – or at least the collecting of fees! Out of season, it’s a lovely walking, jogging, cycling trail with pretty views. We set out on the north shore, heading clockwise. 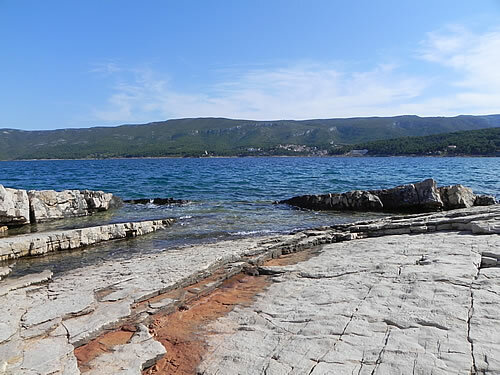 Of course, Glavica (pronounced Glavitsa) does actually mean headland, and this is a fairly small peninsula with a nipped in waist at the Soline beach and convenient parking area (still free in the off season). I’d hate to give the impression that this place is busy at this time of year – it’s simply not. On our afternoon stroll we saw a couple of people on bikes, a runner (he went round twice), and this moped parked above a lovely quiet beach. Every picture benefits from a touch of red, I feel! 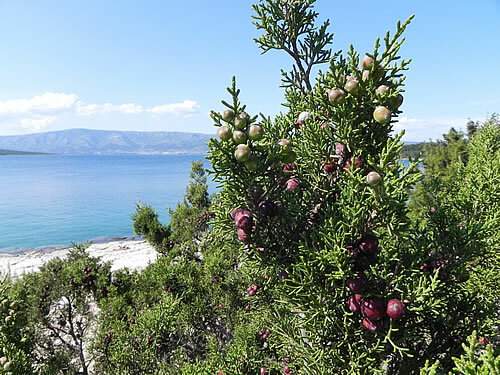 The air on Hvar is so aromatic! 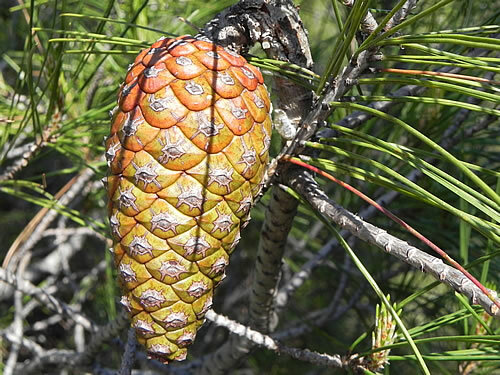 The background fragrance here is of warm pine, and juniper. We found these colourful berries growing on a bush right next to the path. 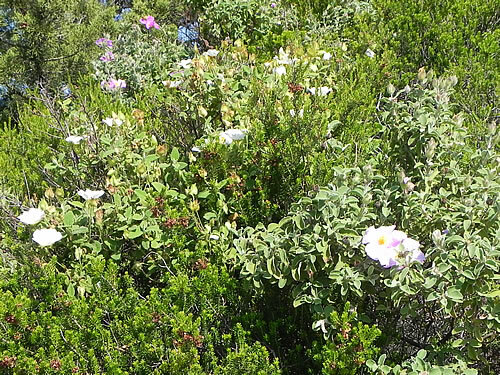 There are also rock roses everywhere – providing cheery splashes of pink, white and yellow. Off to the northwest, we can now see the mainland – a massive wall of rock looking like it’s just painted on to the sky, and capped by the usual billowing clouds. 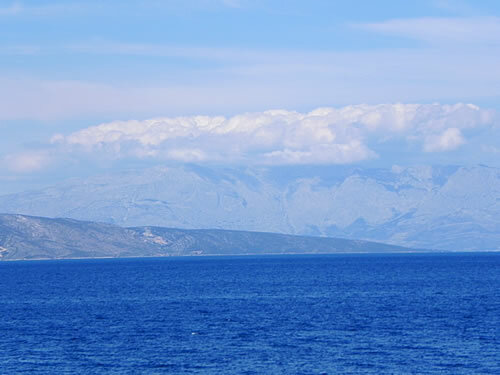 That is the mountain of Biokovo, with the highest peak of Sv Jure around 1762 m (5,780 feet). That’s some wall, given that it rises pretty much from sea level! 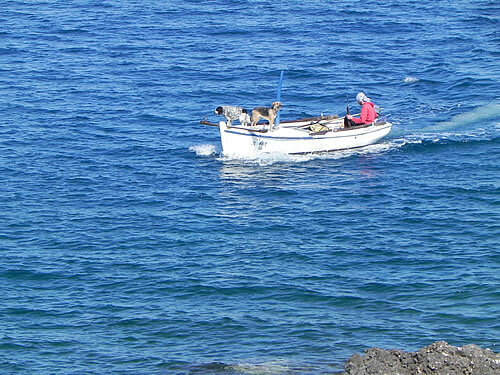 An alternative way to round the headland is by boat – does this count as walking the dogs, though? They seem to be having fun! There’s artwork here, too. A large archway made from tree-trunks, and painted the colours of the sea. 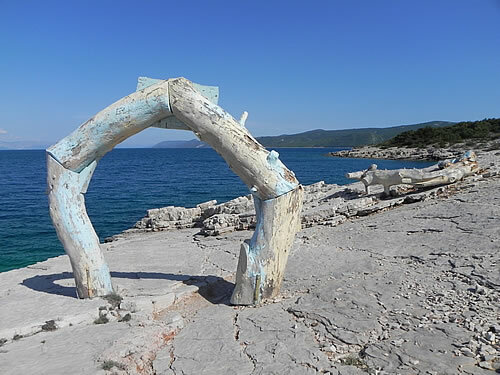 This kind of natural sculpture can be seen dotted around in various places – with my favourite being the three large carrots on Zečevo island. Which name, of course, means rabbit. 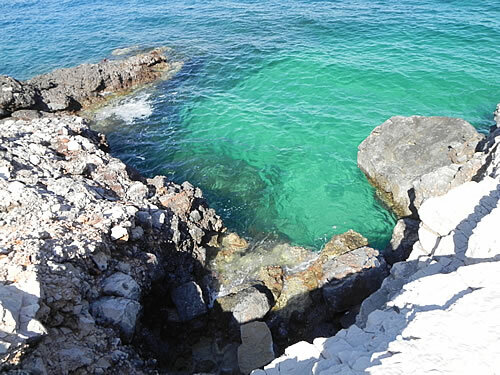 And then there’s the views of the sea – the shifting blue-green against the rocks. The water is so clear you can look right in and watch the fish. In the summer this would be very inviting to just jump in – right now, it’s a bit too chilly for me! From time to time, the path leads us away from the shore and into the pine trees. It’s nice to be in the shade, and we’re grateful for a bit of a breeze on this north shore. It’s a warm day. 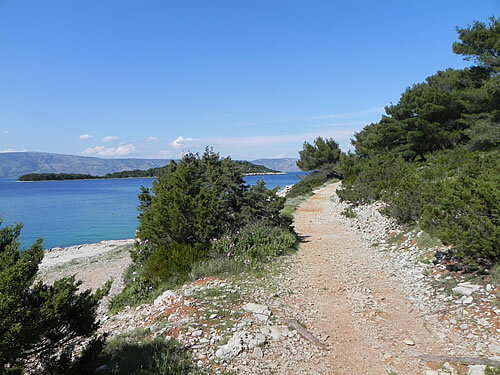 As we come towards the most easterly point, we start to see the rest of the island of Hvar stretching off into the distance, and the town of Jelsa appears. 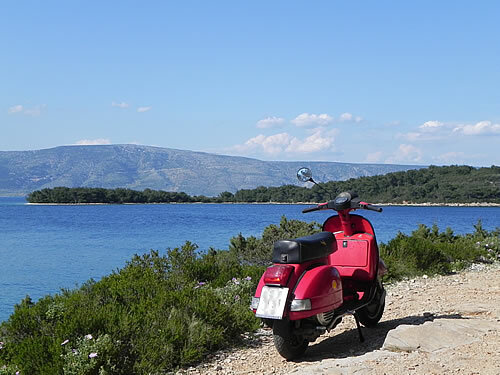 It lies across the inlet that takes you into Vrboska. 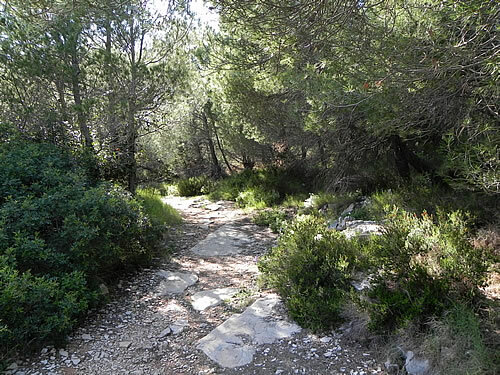 Towards the most easterly point and turning south, the path once more takes us into the pine forest that covers most of this headland. In contrast to the more exposed northern shore, on the south side the trees grow right up to the beach, providing lots of shade. 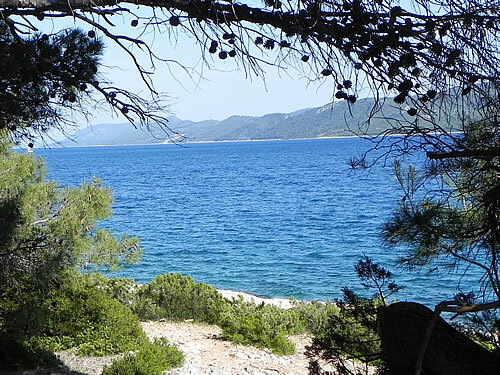 Every so often, the trees provide a natural frame for views of rocky shoreline and the eastern end of Hvar. At the furthest point of the trail, there’s a sloping beach with a circular rock formation with ideal sitting and sketching and/or picnic possibilities. I make a note of it for next time! In fact, the whole peninsula has wonderful possibilities, and another time I’ll definitely bring my paints. The walk back along the southern shore is shady, peaceful and pleasant. There are a few gravel beaches here, and a gentler shoreline which seems to be more popular with families. There are even some kids in the water at Soline beach in May – hardy souls! Note: This is an easy circular walk of about 1.3 miles, and doesn’t involve any steep climbs or difficult sections. The trail is wide, though rocky and uneven.